Officers : Martin Child, Patrick Bradley, Bob Warrack, Malcolm McGeorge, David Cullingford, John Brooks, Mike Eldon, John Jackson. David Martin, Charles Roberts, Simon Stoye, Edward Stuart, Andrew Sumner, Ian Whitelaw, John Wilkinson. As I write this report a fortnight's Indian summer has just been brought to a close by two damp and misty days. Autumn is upon us and soon we will be feeling the frosts of winter. At such a time one's thoughts tend to turn back and long for what actually were or what now seem to have been the glorious days of summer. From now on one is in danger of exaggerating and sentimentalising over the summer holidays as they recede into history. Yet Colonsay 1966 must surely be remembered for the pleasure afforded by thirteen rain-free days and for the predominantly happy atmosphere which reigned over the camp. Naturally we had a few problems and grumbles but always cheerfulness and laughter showed through. To all the officers and boys who made it so I am sincerely grateful. By all this my task was considerably tightened. I want especially to thank Pat Bradley and Bob Warrack for all their work with the camp administration and travel. Colonsay has a reputation for being among the most beautiful of the Islands and so we found it. Trees and farmland mellow the more familiar bog and heather of this part of the world and the sandy bays and inlets are not only beautiful but excellent for water sports. Our campsite was situated beside one of these bays, on what was once the golf course. The dozen of us who were brought by Hughie Carmichael on the Shapinsay managed to pitch camp before the rest of the expedition arrived on the steamer the same evening. We were able to do this largely thanks to the generous help of the factor, Mr. Porteous, and his men. Throughout our stay we received numerous kindnesses at the hands of the islanders and visitors. At least for us Colonsay will have a reputation for hospitality as great as that for its natural beauty. I hope that our attempts to stamp out rhododendron scrub and the "dinner party" showed some of the gratitude we felt. 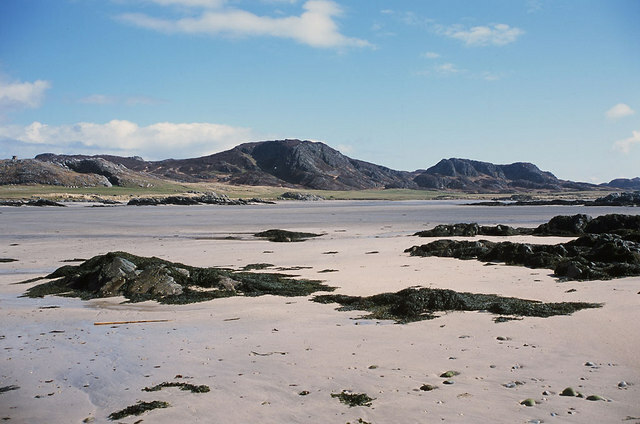 This is the popular Machrins Bay with its large expanse of white sand at low tide. Beinn nan Caorach is the principal hill overlooking the bay. We were indeed near civilisation for an S.H.S. expedition. The village was only three miles up the road, and several crofts were nearer. Yet this was not a hindrance or disadvantage. Colonsay has too much of interest for one to want to be constantly running to the shop. When we tuned into civilisation it was mutually beneficial. Twice we played football against the local team - losing heavily then narrowly - who never have any opposition normally. One evening we went to a concert, and thanks to the skill of our musicians, contributed our little bit to the entertainment. In turn we had the privilege of listening to, and even joining in with, some stirring Gaelic singing. We certainly lost nothing by all this. It is unnecessary for me to enthuse over all the activities we might have done or even for that matter over the things we did do. Members of the expedition have been forthcoming with articles about their experiences and projects and I would like to see as many of these in the Report as space permits. I will therefore make my own comment as brief as possible. 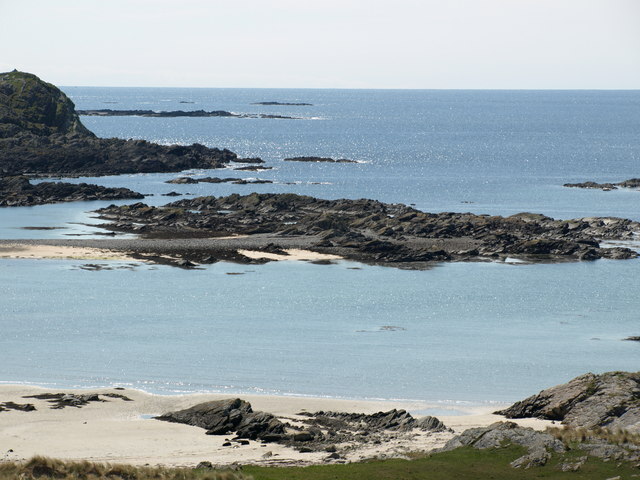 Colonsay has a very rich past as anyone who has read John de Vere Loder's excellent book on the island will know. As well us the priory on Oronsay there are standing stones, burial mounds, caves with Stone Age implements to be found in them and even rumours of gold on a tiny off-shore island. There is also plenty of scope for geographical and sociological projects. We only scraped the surface in our investigation of these things. Climbing and canoeing facilities were excellent and the boys made full use of these activities. Although the highest point on the island is only 500 feet there arc plenty of rock faces of varying difficulty and Bob Warrack was kept busy guiding people up these. Our one canoe was kept constantly in action either by novices like myself just paddling round the bay or by those who felt more competent and went flying right round the island. Perhaps in future years a more adventurous bivouac than our own might be undertaken incorporating walking, climbing, canoeing and sailing. Our dinghy "Vinga" was taken out several times but though a beautiful craft she is not an easy boat for beginners and we could not emulate her performance on Jura. Colonsay 1966 was a memorable experience. I hope that the articles that follow will give you some of its flavour. ...We boarded a boat that could scarcely float... - Ah, that'll be the old Loch Arkaig out of Mallaig to Rhum! Phil Renold's farewell letter says that he was a product of the SHS. I most certainly was. Most people have a mentor. I had them in spades. I set off for Colonsay as a callow youth just before my 13th birthday (most of my formative years birthdays were spent with the SHS!). My mother said that when she went to Euston to pick me up, she almost didn't recognise the person who walked towards her.